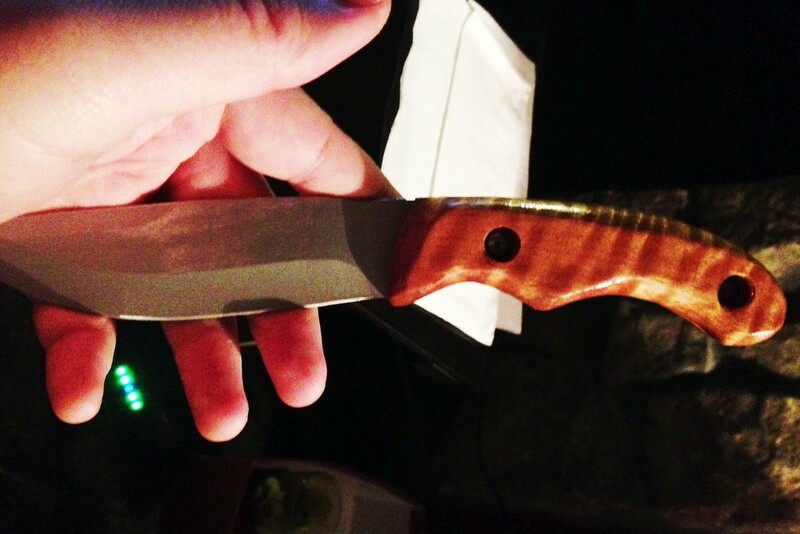 I wound up with this $15 knife from Walmart. The sheath isn't well-fitted, the handle doesn't extend far enough to cover the edges of the tang, and it's cheap wood. But the metal is decent enough, and I could live with the shortcomings—after all, I'm not killing a bear or anything. But I used it for about an hour when I started my whittling project and quickly saw the error of my ways. The tang biting into your palm and fingers, the ridges at the top base of the blade biting into your thumb are uncomfortable, and the handle's too thin. This gave me an idea. I got a 1x.6x.75" piece of Asian Satinwood from the internet, took the handle (handles? 2 sides that make 1 handle...I'm going to call it handle because it's easier) off knife and used that to make a template. The template was copied onto the blank, then futzed with to make the final product bigger and more comfortable to hold. The outline was cut out with a band saw, then the blank was cut in half vertically on the saw and sanded level on a belt sander. The mounting holes were drilled, then countersunk using a forstner bit. The carving was done with a sanding drum bit on a Dremel. I also ground the tang down—specifically the "horn" at the bottom at the handle and the ridges at the top—to make it more comfortable to hold. The handle was then attached and the whole thing rough shaped so everything was flush. Then high grit sandpaper cleaned everything up. Then the outer sides were coated in high-gloss lacquer, sanded down, recoated, repeat three times. If you want something to be really super-glossy, to look like glass, you repeat that step a lot more; but this just needs to coated enough, and pretty enough, that it doesn't start looking gross after its been used a few times. Finally, the finished handle was mounted back onto the blade, and viola, a fancy-looking, but still pretty inexpensive, knife!